Today we decided to hang out in San Cristobal de Las Casas with some other adventure riders – Stephen, who’s currently tooling around Mexico on his KLR (or waiting for parts for his KLR to be repaired, more accurately) and Eric and Sabrina, who are riding 2-up on a BMW F650 Dakar. 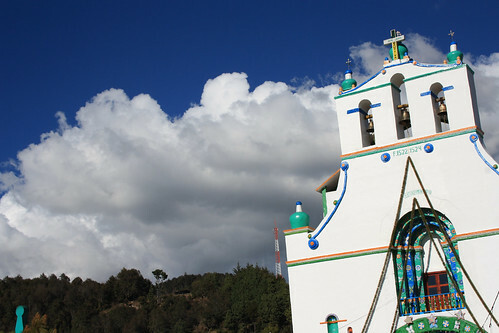 They’ve been in San Cristobal for a while and know some great spots, from delicious food to interesting and humbling sites to see. Today, we puttered around while Eric and Sabrina spent the morning taking their Spanish classes at the language school here, and then we went over to San Juan Chamula, an independent Mayan state about 10 KM from San Cristobal. They had all been there before, and knew a bit about the history of the place, but Stephen, Kay and I hadn’t been yet. We opted to take one of the ‘combi’ busses over to Chamula; on the ride over, we managed to cram 21 people into the bus designed to seat 15. It was impressive. Coming back, we were 10 people in a VW bus designed for 8, so it wasn’t quite so crowded. Just to get to the buses was an adventure. 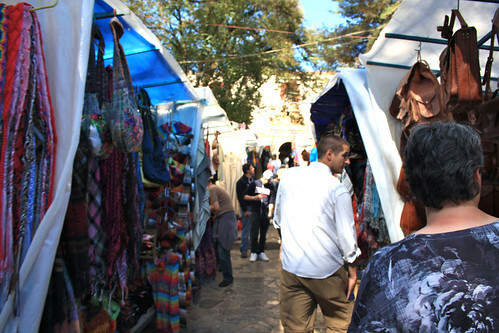 We walked down one of the main streets of San Cristobal where tons of artisans are located. Parts of this boulevard are pedestrian-only walkways, and filled with people. It’s got a great energy and vibe. Then we went through the market, down narrow corridors surrounded by stalls upon stalls of handmade wares; sheltered from the sun by wafting white tents. It’s an amazing place. It reminded me of the alleys that Alex took us through in Altotongo; we never would have found our way through without Eric, Sabrina and Stephen to lead us. Off to the chicken buses, where we paid 10 pesos (less than $1 US) to ride across to Chamula. When we arrived, we proceeded pretty much immediately to the church of San Juan. Eric had told us some interesting history about the church; that when the old church had burned down, the new church was built, but the parishioners (or priests? not sure) “punished” the statues of the saints for letting the old one burn down by turning them to face the wall, and removing some of their hands. The saints have since been turned back around, but some of them are still hand-less. The church itself is an amazing place. There are no pews; instead, it’s got a bare floor covered with pine needles. Candles are everywhere; in front of saints that the parishioners are praying to, directly in front of the alter (which, incidentally, is currently decorated with lots of balloons and flashing lights – not at all what you’d find in a traditional Catholic church) or even in the middle of the floors. Priests wear white (sheepskin?) and lead chants from time to time, or assist in rituals. Eric tells us that live chickens are sacrificed from time to time, although we didn’t see any while we were there today. As much as it sounded like a spectacle, Kay and I were really impressed by the honest belief and faith we saw there. The tourists seemed out of place wandering around, gaping at the Mayan natives who were lighting candles and praying genuine and heartfelt prayers. We saw several people actually crying as they prayed, they were so fervent in their belief (and I assume, the contents of their prayer – most of them pray in Tzotzil, so even the semi-Spanish-speaking people in our party couldn’t understand what they were praying about). It was a humbling experience, in spite of the flashing lights at the alter, the wooden effigies of the saints in their glass display cases, and the tourists wandering around. The natives who went to the church went there for a *reason*. They were there because they had faith in their beliefs and they felt that their prayers would be heard. In spite of the rather unorthodox way the church is presented, the belief felt far more genuine than many of the religions we know here in the United States. One of the things that turns me off about a lot of religion in America is the lack of genuine belief and faith – the fact that for many people, it’s just lip service, or something they do only on Sundays – not an active part of their lives. For the Mayans in this church, it was different. Faith was something that they carried with them every day; something that sustained them. Something that moved them to come to this smoky church and light candles and pray to the saints or to God for the every-day trials of their lives. For these people, religion seemed to be an integral part of their daily life, and it was almost as though we as tourists were trespassing on their sacred place. It was humbling to see true faith. It isn’t something we see very often, and it hits home when you see people praying with all of their hearts for something they need or something they believe. Alas, the Mayans have very strong rules against photography in the church. You can be ejected from the state (or possibly imprisoned) if you take pictures within the church. It was really great to see, and we very much wanted to take pictures, but we couldn’t. And part of me is kind of glad, because I’d really hate to see such a private ceremony turned into even more of a spectacle. It seems almost disrespectful to me to be taking pictures in such a place. Entering the church was 20 pesos each (slightly less than $2 US) for tourists, although I gather it was free for the locals. 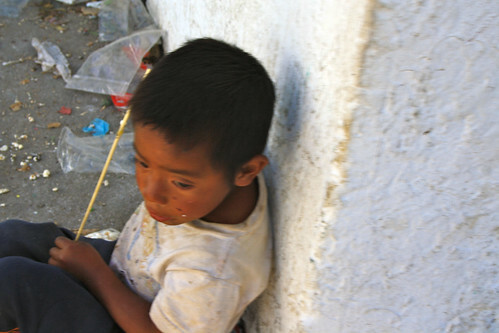 After coming out again, we were surrounded by Mayan children begging for pesos. Neither Kay nor I are inclined to give pesos (we live in Boston, so we’re used to begging) so we shrugged them off, and went to go sit in the shade of a gazebo where we could watch the plaza for a bit and take some pictures of the people there. One of the children had come up to Kay with an obviously practiced look on his face; a child’s idea of pouting and looking pitiful. While we were sitting, a woman came through who had pesos and tried to give a few to one child, I think… and the kids swarmed her. It was like I imagine a piranha attack would be. There were one or two kids near her initially, but almost before you could blink, there were 10 or 15 kids surrounding her, reaching for her outstretched hand. It apparently got rough and you could see them pulling on her and her arm and hand – it was obvious that she was wishing she’d never started this. And then a fight broke out among the kids – one of them had apparently elbowed or hit another one in the face (maybe accidentally, reaching aggressively for the pesos, or maybe on purpose) and the kid who got hit started screaming and crying. Immediately the kids split into two groups. One group gathered around the kid who got hit, while he related his side of the tale. Another group (smaller) gathered around the kid who’d apparently done the hitting, and it looked like he was ready to take on anyone who would try to dispute him for the pesos. After a few minutes, the kid who’d done the hitting vanished, and the kid who’d gotten hit in the face continued to mope around the plaza, crying occasionally and looking pitiful. His face started swelling almost immediately, and after 10 or 15 minutes you could see he’d gotten hit pretty bad. It was a harsh reminder of the reality of this place, and the difficulty of life here. After sitting in the plaza for a bit, we wandered over to the ruins of the old church that had burned down. I’m not sure why they didn’t just rebuild the new church at the ruins, but it’s on the other side of town. 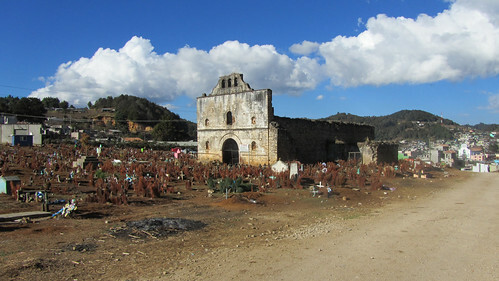 The old church, however, still contains a massive cemetery and the graves of many Mayans. It was a sober place, and the bodies were packed so closely together that you couldn’t even get to the church without walking on the grave mounds. We poked around the ruins for a while, and then headed back to the ‘combi’ bus that would take us back to San Cristobal. We were tired at this point, and the VW bug bus made us feel a little sick from the fumes, etc. so we grabbed the stuff to cook dinner and then sat around for a bit, chilling. Had another lovely dinner (chicken this time) prepared by Eric, Sabrina and Stephen, and sat around chatting and later chilling around the campfire. I’ve really enjoyed hanging out here with these guys. Sabrina and I both agree that it’s a shame we’re not leaving at the same time, because it could be fun to travel together to Palenque (where we’re both heading next) but they won’t be leaving for a few days and we’re on a tight timeframe. It’s been great to meet these guys and I wish we could meet up with them again down the road, but that’s unlikely, as we’ll all be traveling at a different pace. If we had more time, I’d be happy to stay with Sabrina and Eric longer (alas, Stephen is still stuck here waiting for a package to arrive, and then is going to be hanging out in Mexico longer, I think). But this part of the trip is, I think, going to be one of my favorite memories. You two have covered alot of ground with alot more to go. So far can you say you would do it again. From what you have experienced would you say it’s reasonably safe for solo rider. Cheers good luck and keep writing. Glad you’re enjoying our ride reports, Tom! We’d definitely do Mexico again. While the language barrier has been daunting at times, we’ve gotten by, and the riding has been spectacular. I wouldn’t hesitate to recommend it for a solo rider. We haven’t had any situations where we’ve felt unsafe, and we’ve met a few solo riders who haven’t reported any problems. If you’re thinking about Mexico, or farther, I say go for it! Thanks Dachary for the info. Don’t know if I will ever make it that far. Heading back to Thailand soon hopefully I will be doing some riding over there. I plan to follow your adventure so please keep all of us up to date.